Picture the scene: you’re on holiday, the sky’s flawlessly blue, the sun’s shining, you have a cool cocktail in one hand, a bowl of snacks close to the other, the homemade dinner’s in the oven… “Hang on, why am I making dinner,” you ask? “Didn’t you just say I was on holiday?” Yes, you are, but instead of being in a hotel, you’re in a self-catering villa. When holidaying abroad, trying the local cuisine is one of the best ways to learn about the country’s culture, and the easiest way of doing this is by dining in restaurants. 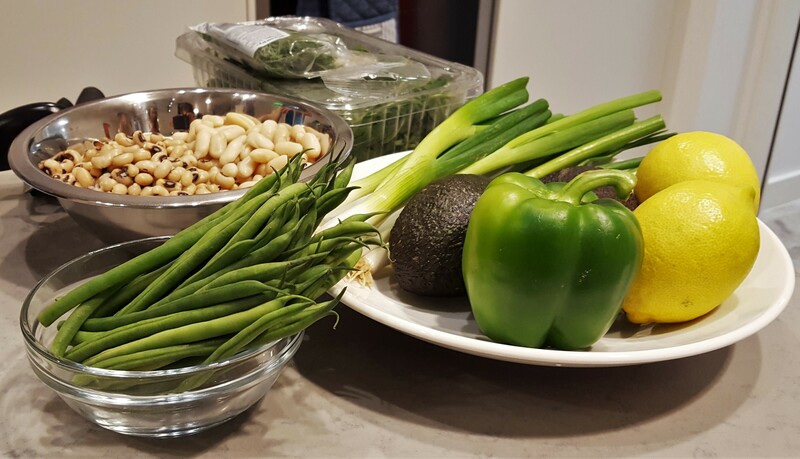 The alternative is to make your own meals using locally sourced ingredients. 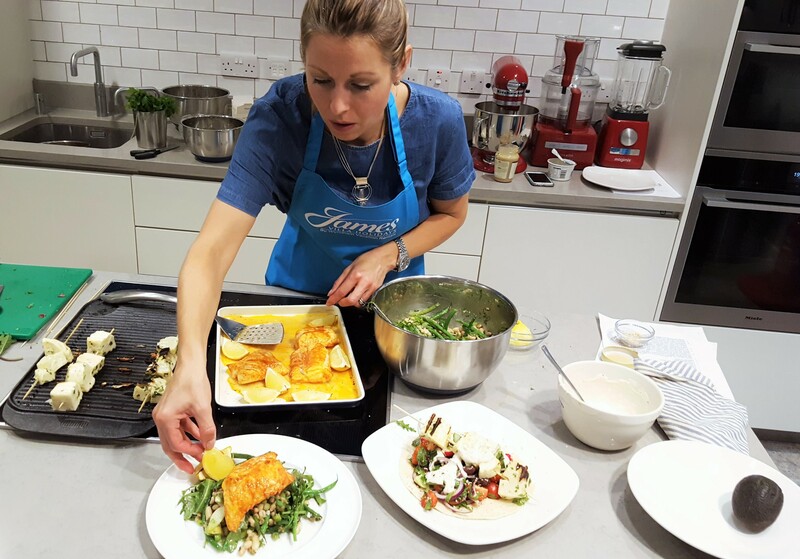 In an effort to encourage holidaymakers to go down this route and take advantage of their holiday accommodation, James Villa Holidays have teamed up with acclaimed TV chef and author Jo Pratt to launch their new My Holiday Dish 2016 campaign. 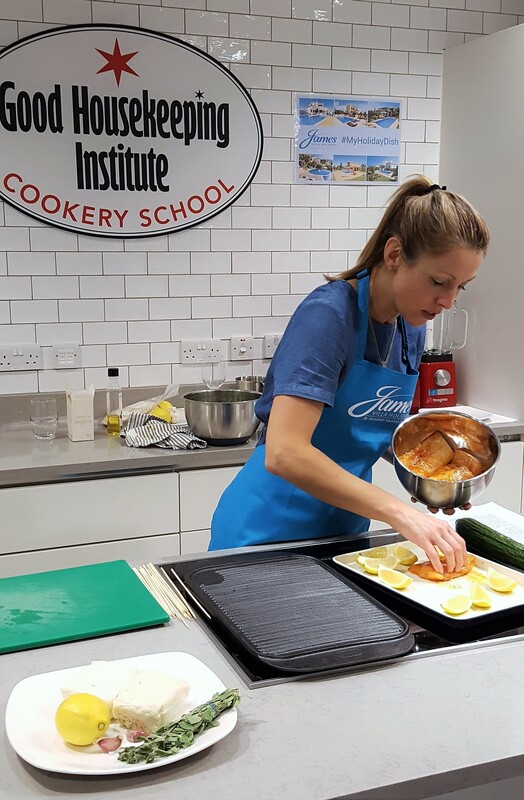 By creating a series of simple and delicious recipes inspired by her last trip to Spain, Jo demonstrates how cooking for family and friends in your home away from home can be fun and stress-free. 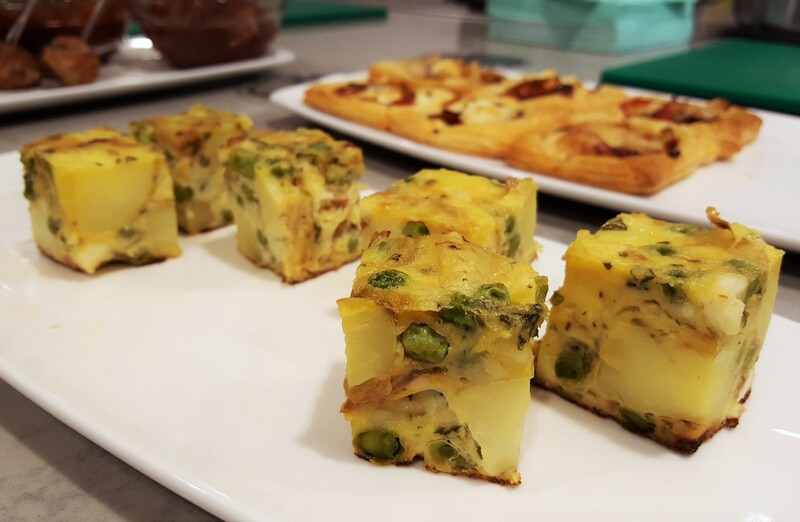 Feta and pea frittata with creamy spring onion dip: Fresh and healthy. 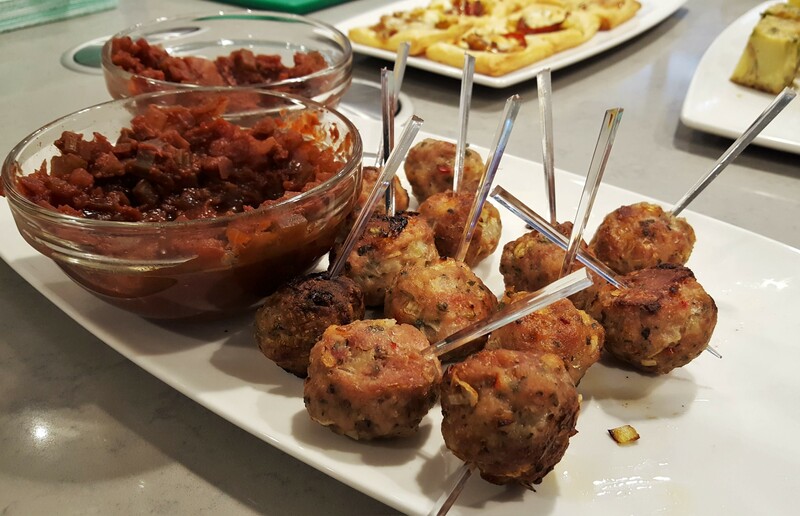 Pork meatballs with rich tomato sauce: Juicy and flavourful. 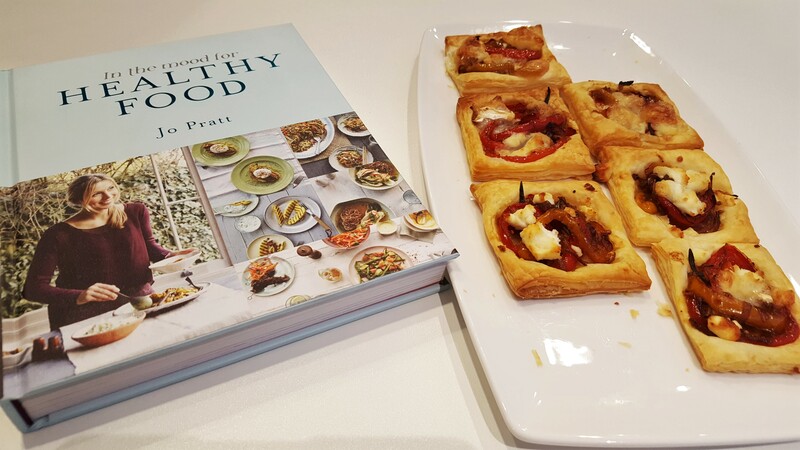 Pepper and goats cheese tarts: Sweet, sharp and flaky. 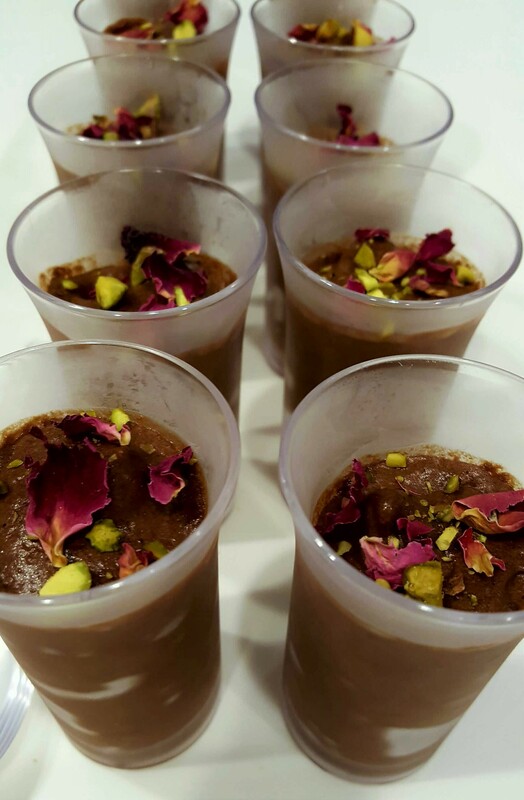 Turkish Delight chocolate mousse: Light with a hint of spice. 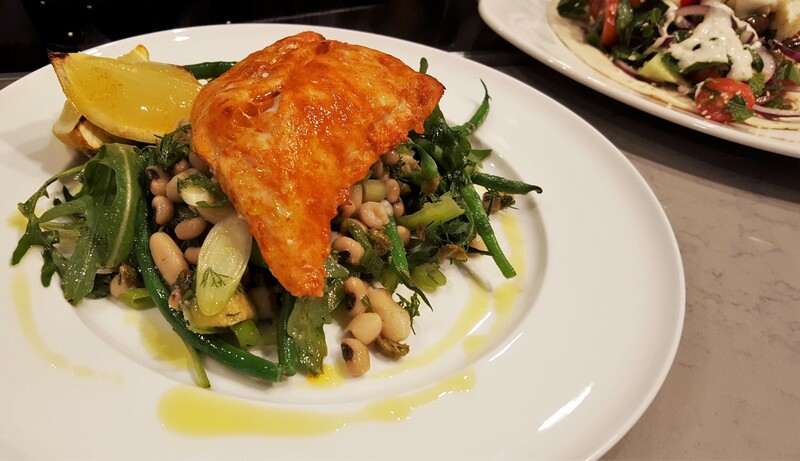 We then gathered around to watch Jo rustle up Baked Spice Fish with Beans and Greens. The beauty of these dishes is that you can adapt them according to the ingredients you have available. Jo used cod in this case, but it could be substituted by any white fish. The paprika-based marinade took no time to prepare, and once the fish was coated in it and set aside, she started preparing the salad. 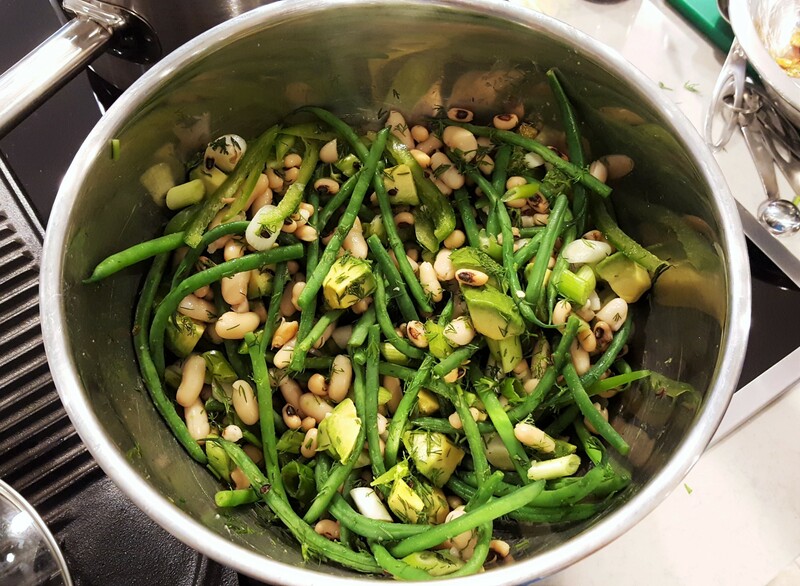 Again, there was very little effort involved: simply slice, dice and roughly chop the beans, avocado, spring onions and dill. The fish went into the oven for 10-15 minutes with some lemon wedges while she made the dressing of crushed capers, anchovies, garlic and olive oil. Plating up was the final step, with the golden fish contrasting beautifully with the different shades of green. Lemon and oregano halloumi kebabs with chopped salad and sesame dressing came next, and epitomises fuss-free cooking. 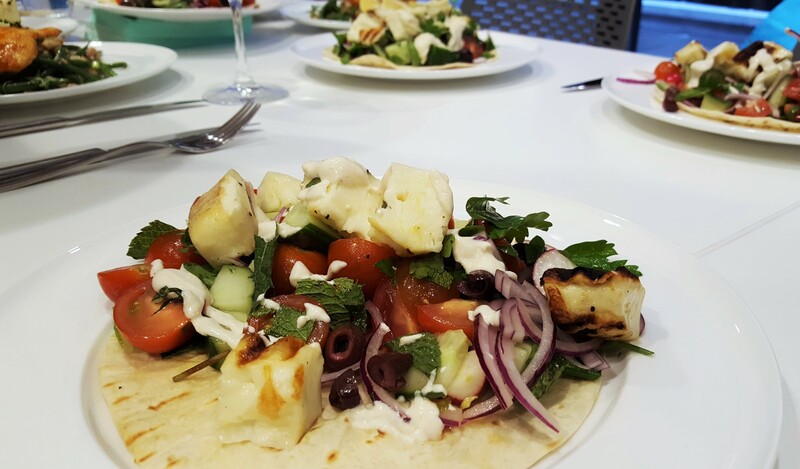 Large chunks of halloumi were generously dressed in fresh lemon juice and oregano before being skewered and griddled. 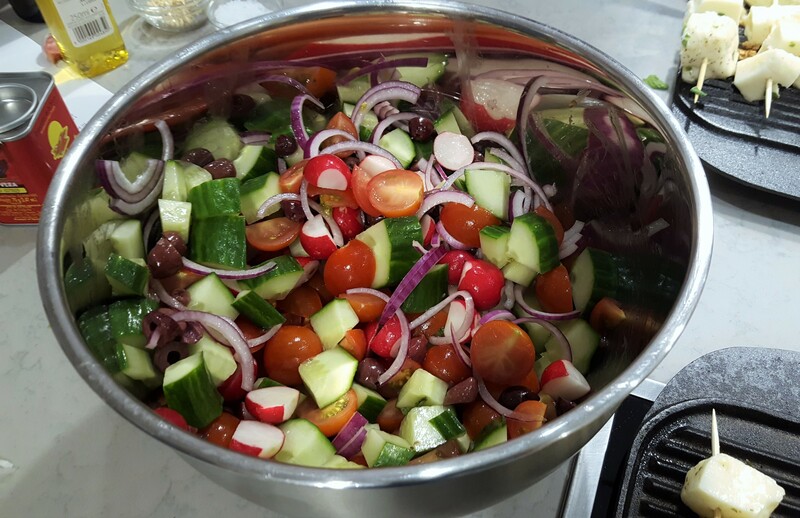 As they gently sizzled in the background, Jo whipped up another easy salad of chopped cherry tomatoes, radish, cucumber, red onion and black olives, any of which could be replaced, if necessary. Her dressing of choice this time was Greek yoghurt and tahini. Just before the skewers were ready, thin flatbreads were warmed through. The grilled cheese and vibrant salad was piled onto the bread then drizzled with the nutty, fresh sauce. I didn’t realise that I’d be doing any cooking until I arrived and saw the islands complete with pots, pans and utensils. 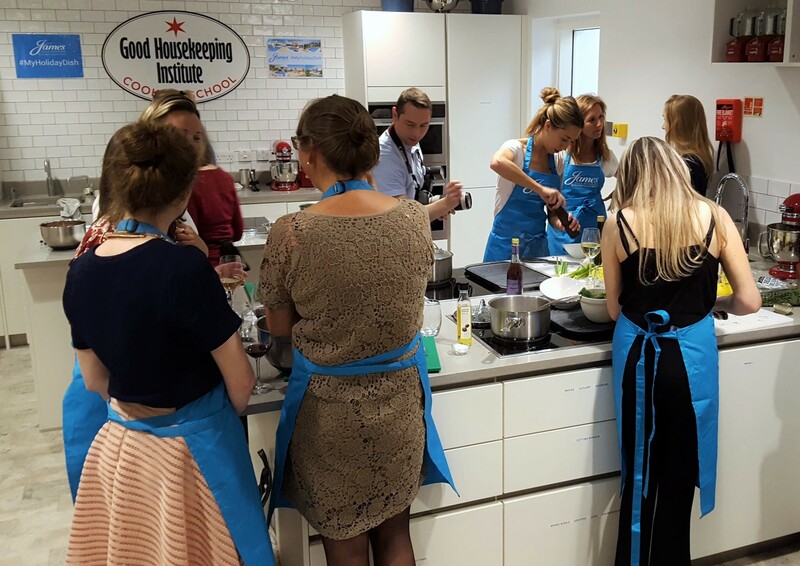 After the demos, we split off into groups and did our best to replicate what we’d just seen; it felt like an episode of Ready, Steady, Cook! It was a great opportunity to meet fellow foodies like Mel (Le Coin de Mel), Katharina (Beautifully Travelled), Ali and Peter (Primary Times) and Saga (The London Sinner) and swap food and travel stories while learning something new. Together we successfully followed Jo’s lead and sat down to a lovely, hearty dinner without having set off any smoke alarms. 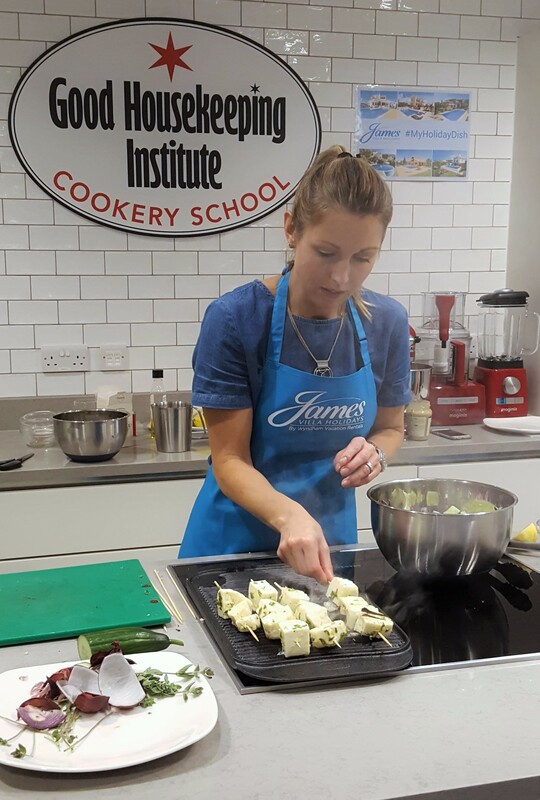 If you’d like to try these dishes, either at home or on holiday, head to the James Villa Blog. 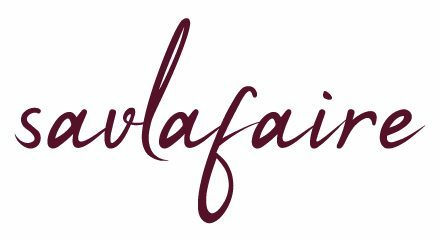 As well as the above recipes, you can find video demos and plenty of articles on holiday planning, keeping children entertained and tips on how to switch off and relax. Disclaimer: I was invited as a guest, however all views and images are my own.